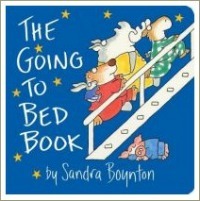 Bed-time stories with a "going to bed" theme are great to incorporate into your child's bed-time routine. Of course, when it comes to bed-time stories you can read any story you like. 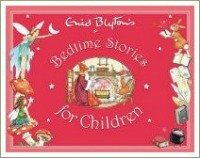 A bed-time story doesn't have to be a book about going to bed or going to sleep! 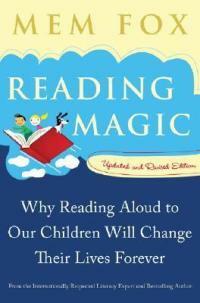 The important thing is to read aloud to your child every day, starting from birth if you can. Reading together at bed-time is a lovely ritual to share and the five books on this page are perfect for reading aloud to your baby at bed-time, starting from his earliest days. 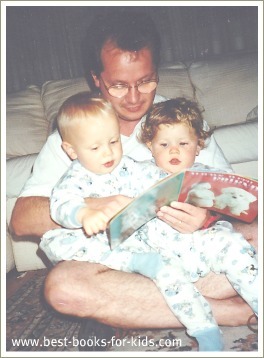 Snuggle him on your lap and hold the book so he can see the pictures as you read. If you read the same story every night your little one will soon get the message that a bed-time story means it's time to go to sleep. This is also lovely because young children love the security associated with rituals. They love knowing that the same thing will happen at the same time every night - it provides some structure for them in a world that can seem unpredictable and even a bit scary as they grow up. If you're looking for a gift for a special little person, you can't go wrong with any of the books on this page. You might even like to create you own gift basket using some of these books, just as I have here. 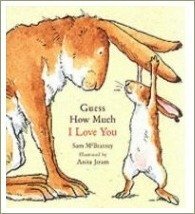 This gorgeous book is a modern classic about a father rabbit, Big Nutbrown Hare, saying goodnight to his son and the "guess how much I love you" game they play together as Little Nutbrown Hare settles down to sleep. 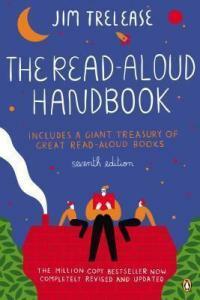 This book is perfect for reading at bed-time and is one of my all-time favourite Mem Fox books. Each double-page spread features a beautiful picture of a different animal Mum or Dad preparing their little one for bed. 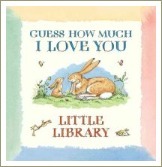 The text for each illustration is written in rhyme and features a gentle, soothing rhythm. The book is suitable for babies from birth and is a favourite with most children. 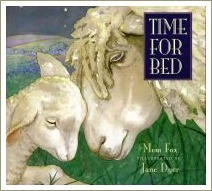 Read about how Mem Fox came to write Time for Bed here. Sandra Boynton is well-known for her wonderfully silly drawings of animals and this book is a real treat. 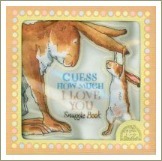 Written in rhyme, the book features a variety of animals getting ready for bed aboard a big boat. We see them having a bath, getting dressed, brushing their teeth and doing their exercises together. 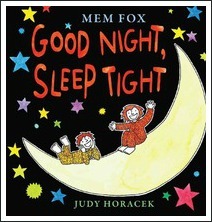 Babies and toddlers love this book for the familiar routine of going to bed and the funny illustrations. It's simply a gorgeous little book! 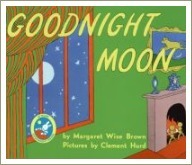 Goodnight Moon was written in 1947 and was a classic bedtime story in North America for many years before it became popular in Australia. 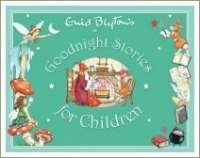 The story is about a bunny's bedtime routine of saying goodnight to everything around him: the red balloon, the bunny's dollhouse, the moon, the man in the moon and so on. Like most books for young children, it's written in simple rhyme. The illustrations in Goodnight Moon are simple but quite detailed which is fun for slightly older children (from about two up). Drawing their attention to things like the moon rising in the window and the time on the clock changing helps develop their powers of observation. You can read more about Goodnight Moon here. 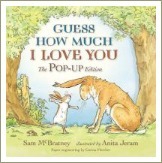 In this lovely little story, Bonnie and Ben's favorite babysitter tells them nursery rhymes at bedtime. Bonnie and Ben enjoy the stories so much that they don't want to go to sleep - they want to hear each one again! Instead the babysitter tells them new nursery rhymes until, finally, all three of them fall fast sleep. A perfect story for reading at bed time.